In this re-aired feature, Late City Edition explores the dissonant reality that faces women enlisted in the armed services: that of increasing opportunity and pervasive misogyny. 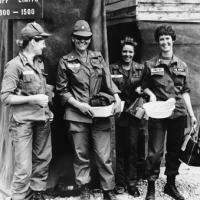 The series features Abigale Wyatt, Helen Schor, and Leslie Paisley - three female Columbia students who have served in the military. We also sat down with Helen Benedict, a professor at the Columbia Graduate School of Journalism whose groundbreaking book "The Lonely Soldier" has been key in drawing attention to the epidemic of sexual assault in the military.